Portronics TORK is the one of the Lightest, Smallest and Most Efficeint 10050mAh USB Power Bank in the Market. TORK that can charge ALL of your USB chargeable Mobile phones, Tablets, MP3 Players, digital cameras. TORK has Dual Output Charging ports with a sliding-shutter and One Input USB port, TORK is perfect for using on long outdoor travels.It has dual USB outputs of 2.3A and 1.5A - and an 1.8 Afast charging input port which fully charges TORK in less than 6 hours. The device comes with a powerful 10050 mAh capacity, allowing the user to charge their devices multiple times through it. The device is designed to be light in weight and handy which is essential for those users who are travelling frequently and cannot afford to carry a large power bank with them. With a charging time of 5-6 hours, it is easy to be refueled of its lost energy simply put it on charge in the night and wake up finding it ready to serve. TORK gives you complete freedom to be truly mobile with your chargeable gadgets. You do not have to worry about compatibility as TORK works well with ALL Mobile Phones like iPhones, Samsung Galaxy series, Galaxy Note, Tabs, HTC, MP3 Players, Digital Cameras etc. Has Original LG Cells, a USB Ports Slider Cover, a Fast Input Charging Port, LED Indicator, Soft Power Button. High quality internal circuit components, superior design and Industrial Grade material offer sturdy body, very high internal and external safety and performance even in extreme conditions. Tork also keeps your expensive devices more safe while charging as the internal electronics of your device remains absolutely safe due to its overload protection design. TORK has Dual Output Charging ports with a sliding-shutter and One Input USB port, TORK is perfect for using on long outdoor travels. Tork comes with sliding shutter, it gives you external safety even in extreme conditions. TORK offers three color options for sliders Red, Black & Blue on white body. Portronics TORK is the one of the Lightest, Smallest and Most Efficeint 10050mAh USB Power Bank in the Market. TORK that can charge ALL of your USB chargeable Mobile phones, Tablets, MP3 Players, digital cameras. 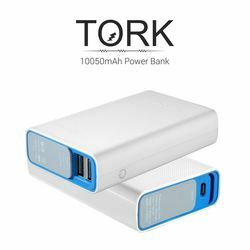 TORK has Dual Output Charging ports with a sliding-shutter and One Input USB port, TORK is perfect for using on long outdoor travels.It has dual USB outputs of 2.3A and 1.5A - and an 1.8 Afast charging input port which fully charges TORK in less than 6 hours.10050mAh High CapacityThe device comes with a powerful 10050 mAh capacity, allowing the user to charge their devices multiple times through it.Smallest 10050 Original LG Cells ChargerThe device is designed to be light in weight and handy which is essential for those users who are travelling frequently and cannot afford to carry a large power bank with them. Quick Re-chargingWith a charging time of 5-6 hours, it is easy to be refueled of its lost energy simply put it on charge in the night and wake up finding it ready to serve.Highly CompatibleTORK gives you complete freedom to be truly mobile with your chargeable gadgets. You do not have to worry about compatibility as TORK works well with ALL Mobile Phones like iPhones, Samsung Galaxy series, Galaxy Note, Tabs, HTC, MP3 Players, Digital Cameras etc.Superior QualityHas Original LG Cells, a USB Ports Slider Cover, a Fast Input Charging Port, LED Indicator, Soft Power Button.In-built Protection SystemHigh quality internal circuit components, superior design and Industrial Grade material offer sturdy body, very high internal and external safety and performance even in extreme conditions. Tork also keeps your expensive devices more safe while charging as the internal electronics of your device remains absolutely safe due to its overload protection design.ConfigurationTORK has Dual Output Charging ports with a sliding-shutter and One Input USB port, TORK is perfect for using on long outdoor travels.Sliding ShutterTork comes with sliding shutter, it gives you external safety even in extreme conditions.Available ColoursTORK offers three color options for sliders Red, Black & Blue on white body.